English summary reprinted from the 1945 Danish publication of the booklet “Solv” released by Aage Weimar. The craftsmanship in silver and gold in Denmark has enjoyed much and well deserved fame for centuries. As an acknowledged trade we can follow its history right back to the time of Eric of Pommerania. It was in 1429 that this trade received the first official acknowledgment, as then the silver ad goldsmiths guild was ratified. Of our oldest silver precious little has been left, so we cannot review a collected series of silver work in chronological sequence. The preciousness of the material has ever tempted people to melt down. Lots of things have only a lifetime of 40-50 years. When the artistic attitude of period and taste altered, no softness was shown, but rather the old things had to go into the melting pot in favor of new work. Mr. Vilh. Slomann, Director of the Museum of Arts and Crafts, Copenhagen, has mentioned the six founders of the guild and established that it is not likely that they had much silver to work with. And so far as it is known none of their productions have been preserved. Nevertheless it is striking to see the amount which is left in museums and private collections from the last 2-300 years. When the old silver enjoys so great and well founded esteem as is the case, it is not merely due to it being old and rare. That would not in the long run be able to make the prices mount and mount. But these old articles of silver work have been executed with skill and love of the material, which makes nearly every piece a precious work of art. Artistic development by no means follows an unbroken ascending line. Already the silver a Christian VIII's time begins to lose the grace and purity of like of former times. Yet you find some excellent, weighty and beautiful silver articles from the (1840's), but it is as if the (commonness) of this period and its lack of style more and more also stamps the silver. Among other things you miss inspiration and fresh impulses. The best that can be said of the silver of this period is its sterling fineness, characterised by honest workmanship. In the (1860's) machinery was introduced and a confusion of styles commenced at the same time without parallel in the past. The first results of the new technical aids were not good. But like almost all technical capacity, mechanical production met with quite an uncritical enthusiasm. In the first intoxication they did not even discover that the sense of the material was more and more thrust into the background in favor of a profusion of scrolls and ornaments on the surface. Even the simplest utility articles were provided with balls, spires and insignificant ornaments. They revel in literary prototypes. A silver beaker should preferably be an entire book of fairy tales with dancing fairies and a barrow on columns of fire. Everything had to be pompous first and foremost, to look elegant and expensive. This applied also to the new so-called cheap production in which the machines had solved the problem of pressing some “metal”, it was flimsy like sheet metal and provided with raised whipped cream ornamentations. Some of these descriptions have been described as “New Rococo” and others as “New Romantic”. Virtually the end of the last century signifies a dissolution tendency in art work in the skilled trade, the only flowers of which were in sham literary aesthetics. But people of that age viewed this work differently. The more impossible the designs for the making provided by the “artists” were from the craftsman's point of view, the more enthusiastic were the critics and the public. Regeneration did not come from the camp of the critics but from the executants of the craft themselves. 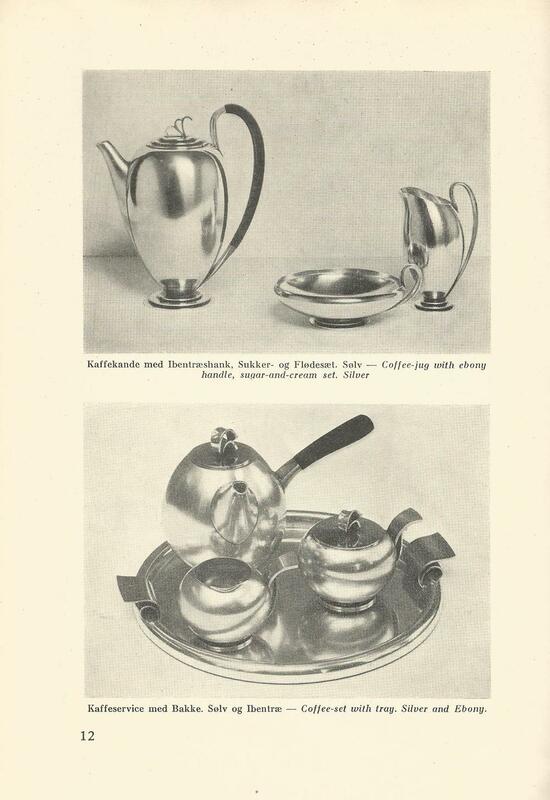 It was Bindesboll, Johan Rohde and silver artists like Mogens Ballin and Georg Jensen, who first realised that a purge and recreation in Danish silver was needed. 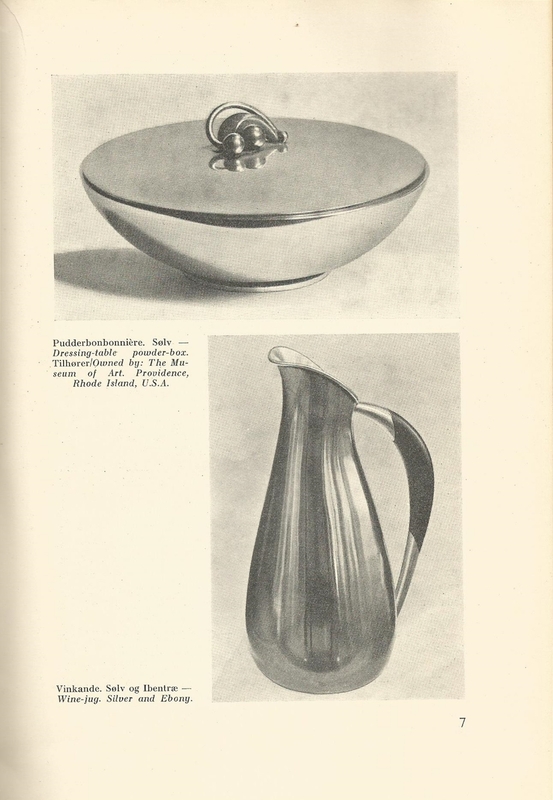 Georg Jensen especially was something of a rebel when he stepped forward. He made a clean break with the limitations of style and fought for new lines and shapes. People were indeed then – that was about 1904-5 – on the point of tiring of the Rococo teapot and suspended singing table (tea urn), and Georg Jensen's new silver gained a comparatively quick success among quite a great public. Georg Jensen and his collaborators subsequently got the opportunity to show that they really had something new at heart. Rome was not built in a day, and a new style is not created merely by summoning it to will. It must be granted time to nature and develop in a natural alliance with time and its spiritual currents. About 1922 functionalism had its break through, In craftsmanship and the skilled trade new points of view made their entry, of a revolutionizing influence. Already now we can look back on functionalism and its deterioration into “Funkis” with equanimity and in cool survey. The significance of functionalism to craftsmanship was as great as cubism was to the painter. That every new line of art degenerates and is misunderstood by some officious business people and a number of less intelligent artisans and artists is regretable, but cannot detract from the value of the new style. As far as the silver was concerned functionalism was both valuable and dangerous. A purge was effected, and the noble and pure form and line again came into the seat of honour. But emptiness lurked behind the exacting simplicity. Silver is a soft and pliable material which has a natural need of working. There is something paradoxical in such an endeavour with great technical labour to let the silver appear in large sober surfaces in a rectified form as if it was stainless (steel). When therefore the first enthusiasm about dogmatic functionalism had subsided, there appeared a new silver craft which is still developing. A fertile collaboration between architects and silver smiths was effected at a number of our leading silversmiths. At numerous exhibitions at home ad abroad Danish silver has in our time scored great triumphs. America, not least, has accorded an enthusiastic reception to the beautiful and comprehensive representative collection of modern silver. The great ambulant exhibitions have been excellent propaganda for Danish craftsmanship just as special branch shops of Danish silver have prospered in American cities. Among the young silversmiths who are zealous and skilled at their task is Aage Weimar, son of he renowned silversmith Evald Nielsen. It is natural that he who has grown up with good silversmiths traditions has had an urge to work independently. His trinkets are second to none in his affection and his discovery of silver nuggets as a material for trinkets has proved a success among the public. His greater silver work shows a sound and natural attitude and a single quiet effect in line. At a traveling exhibition arranged by The National Association of Danish Arts and Crafts in U.S.A., the gallery of Art, Omaha, acquired a set of Weimar's spoon, fork and silver handled knives and his beautiful silver dish with cover, a sterling and sober piece of work. His works have scored an even greater success in the Museum of Art, Providence, Rhode Isl. The Director of the Museum, Mrs. Murray S. Danforth secured during a visit at Copenhagen a series of Aage Weimar's works. Among these may be mentioned the small silver dressing table powder-box, the hand mirror, the plain smooth round tray, the jewellery box and the toilet suite: hair brush, comb and clothesbrush, the quite plain spoon, fork and silver handled knife and the sweeping gravy-spoon. Among Aage Weimar's most successful greater silver works ought also to be mentioned his teapot, which is both sober and frank with its spheric shape, the hot water jug, the chairman's bell and the coffee service, the quaint cruet and last, but not least, the beautiful silver basin with its fine and unaffected profile. Danish silver has been and ought again to become one of Denmark's most distinguished articles of export. Silver will continue increasingly to be the ornaments of the home also in this country. It is the small luxury attributed to celebration. The artists of silver ought to remember that to the public the conception of “silver” is associated with celebration. In the production of the future it is therefore essential to keep this in mind. The best of the old silver has indeed been created by the vital excess of the artist's mind. A modern production should, as it is plainly established here, not be carried by epigones. But even if you are not looking for the pasticcio you can learn a lot from the old: their skill, their sense of (structural) character of the silver and a wise (esteem) concerning the full capacity of the material. Then the artists of our period must make their own effort in shape and line. A production typical of its period is not created by common prescription, but it is the effort and sustaining idea of each individual artist which imparts to the new time its countenance. Not the reverse order.